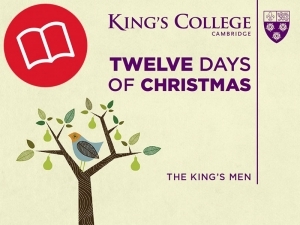 The King’s Men is the close-harmony vocal group formed by the current Choral Scholars of King’s College, Cambridge. Twelve Days of Christmas showcases the lighter side of their seasonal repertoire including Away in a Manger and Gabriel’s Message alongside classic favourites such as Rudolph the Red-nosed Reindeer and Santa Baby. Pat Dunachie, now First Alto in the King’s Singers, can be heard channelling Mariah Carey in All I Want for Christmas is You. Unlike many close-harmony groups, The King’s Men record together in a natural acoustic, instead of tracking each voice separately in a studio. This results in stronger musical cohesion and a more authentic sound.